What are speeding ticket points in Virginia and how do they work? The Virginia DMV has an extremely complicated demerit point system that affects all drivers who have a Virginia license. The point of this article is to try to explain the basis of the system and how it works and how it affects you as a driver. Whenever you get a license in Virginia, you start off with zero points on your record and that’s a good thing. It’s a neutral record. For every year you go without receiving any kind of a moving violation or point-related offense, you get a plus one bonus point on your record. Each time you get convicted of a demerit point violation, you lose points off your record. Note that this makes Virginia different than most other states. Most other states that I’ve encountered go the opposite direction with points. Having a negative or zero balance in a lot of states is a good thing. However, in Virginia, having a positive balance is a good thing. The absolute best driving record you can have in Virginia, point-related, is a +5. Some judges in the Fredericksburg area would call a clean driving record one with no marks at all on it a “true +5,” meaning that you have plus five points because you have never had any problems, at least within the last few years. Do You Have a Dispute With the Virigina DMV Over Your Driving Record? Safe driving points in Virginia can be beneficial in the long-term. If you think your safe driving points are at risk, contact me to discuss your case. How many points can you get before you get in trouble? This is one of the most common questions that I hear from clients when they’re facing a ticket: How many points can you get before the DMV comes knocking on your door with trouble? Unfortunately, the answer to that question depends on many things. The DMV point system in Virginia is quite complicated, and there’s no set answer for how many points you’re allowed to receive. It all depends on your record, the violations at issue, and a few other factors. The basic rule of thumb is that as long as you keep your point balance, as long as you do not receive more than twelve demerit points within a year, and especially more than eighteen points within two years, then you should not have any issues with the DMV regarding points. Note that the DMV is not typically looking at your point balance and considering good points vs. bad points. They look at how many demerit points you acquire from moving violations. Let’s take a quick example. If you start off driving and have zero points, and then you receive three four-point tickets within twelve months, that will acquire twelve demerit points in that period of time. Twelve points within twelve months are one rule that the DMV uses to take adverse action against you. That’s kind of the first step of the DMV point system as far as being in trouble. Even if you take a +5 bonus point driver improvement class in that same twelve month period, the DMV will typically say that you received twelve demerit points; therefore, you will still hear from them about the point system. That’s why the best rule of thumb is to always make sure, of course, that you don’t receive tickets. If you do get ticketed, make sure that you don’t receive more than twelve points in a year and, if possible, no more than twelve points in two years. That should keep you safe from the DMV’s adverse action with the point system. What steps does the DMV take if you get too many points? The first step the DMV takes if you receive too many points is that they send you a letter about the point system and refer you to a driver-improvement program. That first step is triggered when you receive twelve demerit points within twelve months. You will have to complete a twelve-hour driver-improvement class and you will have to make sure the DMV receives proof of completion. If you receive eighteen points within twelve months, the DMV automatically suspends your driver’s license. That’s considered a rapid-point-accumulation suspension and you don’t get any warning. You simply get suspended by the DMV for receiving too many points. The other rapid-point suspension is if you receive twenty-four points within twenty-four months. If you receive twenty-four points within two years, the DMV will suspend your license essentially automatically. How do probation and license suspension work with the DMV? That means that basically, you’re on a kind of a warning level. The DMV tells you that if you receive another ticket while you’re in that control period, then you will be advanced to what they call a probation period. 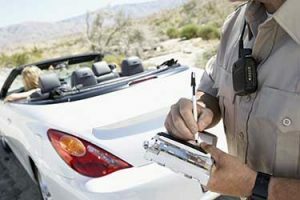 Once you’re on probation, if you receive a conviction for a demerit point offense on probation, you automatically get suspended no matter how many points that ticket takes away. The quick example is that if you have no tickets and no points, you’re just a regular driver, and you receive a ticket. It’s not a big deal as far as the DMV is concerned. However, if you’re on a control period, that’s the second level up. The control period is where they’re watching extra close on your record and if you receive a ticket, you will be advanced to the probation stage. Then, if you’re on probation and receive a ticket where you’re convicted of a point-related offense, you will be suspended by the DMV. Can you get a restricted license for a DMV suspension? Yes, you can in some circumstances get a restricted license for a DMV suspension. If you are suspended for violation of your DMV probation and it’s your first suspension, then you should be eligible to get a restricted driver’s license to drive for work or school. However, if this is your second suspension by DMV, then you cannot get a restricted driver’s license unless you had advanced far enough in the point program from your previous suspension. The real problem is that you’re jumping straight to a suspension for rapid points, you probably are NOT eligible for a restricted license. How can you clean up your driving record to remove points? Unfortunately, it’s not that simple to clean up your driving record. The DMV point system, as I mentioned above, is looking at how many demerit point violations you receive. They’re not looking at your overall driver point balance, and therefore it’s not easy to try to clean up your record. One thing you can do sometimes to help with your point balance is to take a driver-improvement class voluntarily. If you do that, you get five bonus points added to your record. However, be sure to remember that those five bonus points probably do not help you keep out of trouble with the DMV system. The best thing you can do to help your record is to not prepay tickets and to hire a local expert traffic defense attorney if you receive a ticket. Depending upon your record and the details of your case, there may be ways to have a charge dismissed completely or may be reduced to a non-point offense, so that way your driving record stays in better shape. That’s really the best way to fight these things is to try to head them off at the pass, so to speak. If you have old tickets on your record that you’re trying to clean up, there may not be anything that can be done unless there’s a unique problem such as identity theft. If it’s still within sixty days of the conviction, then it may be possible to reopen the case and try to get the judge to give you a new hearing to consider giving you a better outcome. How do I find out how many points a ticket is worth? In Virginia, the DMV has a simple system to tell you how many points a ticket is worth and you can find the full list of points and tickets on the DMV’s website. However, the general rule of thumb is that every ticket is worth three, four, or six points. More minor tickets, such as low-level speeding and some minor license-related offenses, are worth three points. An average speeding ticket for a higher speed and things like following too closely are worth four points. The most serious offenses, such as reckless driving, DWI, and driving on suspended, are worth six points. You need to find where your ticket fits on the point table and then you will know what exactly you will be facing if you’re found guilty of that offense. 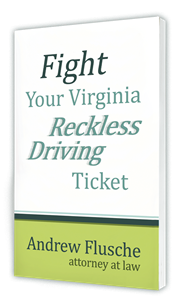 As I mentioned above, if you’re facing any kind of a point-related offense in Virginia, the best way to get in front of the system right now is to fight the ticket. Prepaying a ticket is pleading guilty. If you prepay it you will be found guilty of the offense, and if there are points it will go on your record. The way to fight the points and try to keep your record looking better, while avoiding the DMV’s wrath through their system, is to fight the ticket and hopefully have it dismissed or reduced to something better. If you’re facing a traffic ticket in Virginia, definitely contact me so that we can discuss how to fight your ticket and try to save you the points.